How cute is this guy? Doesn't he look like he's having so much fun? 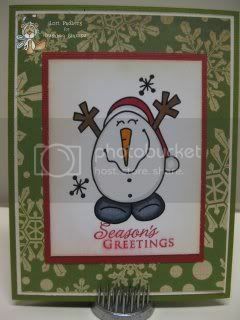 He's called Chubby Snowman 2 and you can find him in the store just by clicking on his name. Hopefully, you've been keeping up with making your Christmas cards so you'll be in good shape when December rolls around. If you haven't started yet, you can jump right in now! You can also head over to the Catch the Bug blog to see what the rest of the Bugaboo DT wants to show you today for Oldie But Goodie Day.